FiberBond LP | Hawk Research Laboratories, LLC. The toughest, longest lasting epoxy coating in the industry, FiberBond 5000 topcoat is a two component, satin finish, extremely high-build coating system with unmatched performance for pools and spas. 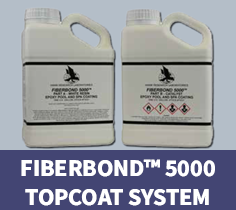 FiberBond 5000 topcoat is available only in gallon kits in white and tranquility blue.